Register to attend an 8-hour-long study marathon hosted by the University Library. 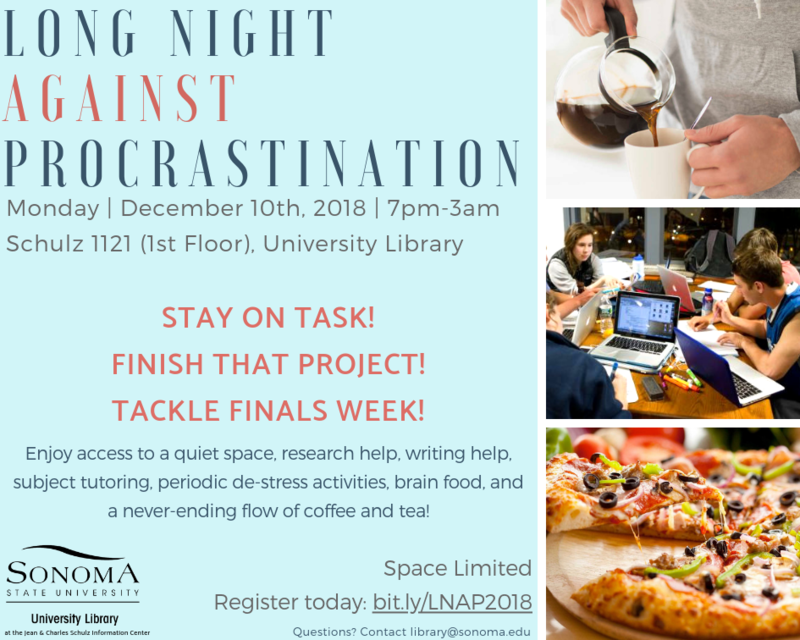 Kick off your finals week right by tackling your project deadlines and exams in a supportive, private, and intimate space. Work alongside fellow students in a study-intensive space and keep each other on-task and accountable for studying & finishing final projects. During the Long Night Against Procrastination, students will enjoy all the comforts and services the University Library can provide: a quiet room, access to research librarians, subject tutoring, writing help, brain food, periodic de-stress activities, and a never-ending flow of coffee and tea. Space is limited to 45 students.